Paulton is a large village and civil parish, with a population of 5,302, located to the north of the Mendip Hills, in the unitary authority of Bath and North East Somerset (BANES), England. Sam Hollis was an English football trainer and manager. The 1922–23 season was the 31st season of The Football League. Joshua David Klein-Davies is a footballer who plays as a striker for Prescot Cables. Thomas Charles Boucher was an English professional association football player at the turn of the twentieth century. He made over 130 appearances in the Football League and over 60 appearances in the Southern League as a centre-forward or inside-forward in the years either side of the start of the twentieth century. Joseph Richard Cottle was an England international footballer, who played as a left back prior to the First World War. He played over 200 Football League games for Bristol City before a broken leg halted his City career. He later joined Bristol Rovers. Thomas William Cyril Gilhespy is an English former footballer who made almost 200 Football League appearances for seven different clubs as an outside right. John J. "Jack" Walsh was an English footballer who played as a right back. Frank Vallis was an English footballer who played as a goalkeeper. 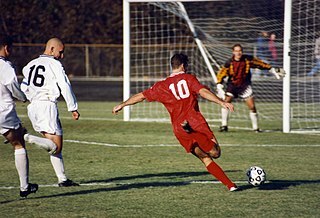 Albert Edward Keating was an English footballer who played as an inside left. He made 175 Football League appearances in the years after the First World War. Walter Henry Jennings was an English footballer who played as a right half. He made over 150 Football League appearances in the years before the Second World War. Richard Johnstone Armstrong was an English footballer who played as an inside right. He made over 130 Football League appearances in the years before the Second World War. A John "Jock" Hamilton was a Scottish footballer who played as a centre half. He made over 90 Football League appearances and over 120 Southern League appearances in the years before the First World War. He was also trainer at Fulham and manager at Bristol City. Robert Cooper Allen Wright was a Scottish footballer who played as a left half. He made over 20 Football League appearances in the years before the Second World War. John "Jack" Boxley was an English footballer who played as an outside left. He made over 290 Football League appearances in the years after the Second World War. John Vincent "Johnny" Watkins was an English footballer who played as an outside left. He made over 180 Football League appearances in the years after the Second World War. Robert Gordon Williams is an English former professional footballer who played as an inside left. He made over 320 Football League appearances in the years after the Second World War. Trevor Frederick Jacobs was an English footballer who played as a right back. He made over 210 Football League appearances in the years after the Second World War. Mark Wilson Gavin is a Scottish former footballer, who played as a winger. He made over 290 Football League appearances in the years 1980's and 1990s. Donald George Gillies is a Scottish former footballer, who played initially as a forward but latterly as a right back. He made over 230 Football League appearances and 45 Scottish League appearances in the 1970s in the years after the Second World War. Alf "Jasper" Geddes (born 1871 in West Bromwich and died 1927 was an English footballer who played as an outside left. He made over 70 Football League and 130 Southern League appearances in the years before the First World War. William Fulton born in Alva, Scotland was a Scottish footballer who played as an inside left. He made 39 Football League appearances scoring 4 goals and 25 Southern League appearances scoring 8 goals in the years before the First World War. Fulton also played for Alloa Athletic in Scotland. Robert H. "Bob" Davies was an English footballer who played as a left back. He made 65 Football League appearances and 60 Southern League appearances in the years before the First World War. ↑ Joyce, Michael (2004). Football League Players' Records 1888 – 1939. Tony Brown. ISBN 1-899468-67-6. 1 2 Woods, David; Leigh Edwards (1997). Bristol City FC The First 100 years. Redcliffe Press. ISBN 1-900178-26-5. ↑ Woods, David (1994). Bristol Babe The First 100 years of Bristol City FC. Yore Publications. ISBN 1-874427-95-X. This biographical article related to association football in England, about a defender born in the 1880s, is a stub. You can help Wikipedia by expanding it.